ALL WEATHER ANALYSIS – Page 2 – "Dont Gamble ………… Invest"
This is not out of desperation it is a play I feel that looks slightly over-priced. I generally do not look too deeply at Dundalk merely due to time restraints but religiously compile the ratings. Yuften looks the obvious one at the weights but I just have a sneaky suspicion That Is The Spirit may turn around the form of their last meeting which was in a similar race here back in November when Yuften romped home beating My selection by over 11 lengths but there are a few reasons I think That Is The Spirit can get much closer today. The main reason is that last run was over 8 furlongs a trip at which Yuften is clearly superior but today we race over the specialist trip of 7 furlongs for which That Is The Spirit is head and shoulders in front on form with wins off 90,95,105, 99 and 90. His last two runs over this CD can be forgiven as he was returning from an absence of 117 days and 116 days, both times in strong handicap, 0-95 and 0-90. The other reason I think he can improve today is he looks more than likely to get an uncontested lead from stall 3 with a far superior Early Speed Rating to anything else in the race. This is his third run after a break so should strip much fitter the main question is how much ability does he retain. Nice to bag a 7/1 winner on my first day back but Today’s racing is bordering on terrible. Newcastle is not My favourite punting track but there is one I have backed. the speed so with a few of these likely to go forward including the first time blinkered Prescott runner dropping back in trip who I expect to be ridden aggressively we should get an honest gallop and a true test. The very capable Theodore Ladd takes 5lbs off her back and with the width of this track she should have no trouble in running. I honestly thought she would be close to an even money shot so even though 3/1 is not my usual bet I still feel she offers great value. A very mediocre day’s racing and not one in which I will be getting too involved in. There are three races only that I am interested in today. None are very strong selections but runners I feel offer a little bit of value in weak races. BABY GAL – Is my selection here, she seems to be improving steadily since the introduction of the blinkers and would not need to approve from her last run to win this. At first glance stall 13 (now 12 due to the non-runner) would look a big negative but with almost 3 fur;longs to the first bend the outside draws have the best record in 15 runner races and stall 12 has the highest impact value. INVISIBLE STORM – Again is another runner drawn wide but that does not worry me as again the wide draws tend to fair out ok. The pace angle is slightly confusing as a few of these have shown a tendency to go forward but none are guaranteed and the selection has shown a decent early speed over 6 furlongs. I am hoping connections use forcing tactics and make this a catch me if you can race. This looks far easier than her last race with an average rating of just 49 compared to 57 last time out. Jockey and Trainer have a profitable 15.58% strike rate together. CALEDONIA LAIRD – Is a three-time CD winner who was withdrawn from a slightly weaker race last weak this is a very interesting runner. He run better than his position suggests over CD first time after wind surgery back in August off a mark of 59 in a race with an average rating of 62 and races today off 52 in a race with an average rating of 12lbs lower. All 3 CD wins have come off higher marks than this, twice at 59 (both coming from similar draws) and latest off 55. Today’s very capable jockey who is 2 from 2 at the track for this yard takes off another valuable 3lbs. An absolutely fascinating contest for one with so few runners. Scottish Jig sets the standard on pedigree being a full sister to 115 Rated Group 1 winner albeit on turf. I am slightly worried about suitability to the surface for this runner especially at a short price as the Sire’s three-year old progeny are relatively lightly race on Tapeta since 2016 he has only produced 1 winner from 6 runners. Apart from a blip in 2017 when he was 0 from 6, J Gosden has been generally profitable to follow here with his three-year old fillies showing a 35.29% strike rate returning a level stakes profit of £11.81 although his favourites return a better strike rate of 45.45% they are not profitable to follow blind although they do just break in to profit when ridden by Rab Havlin who is 3 from 6. Pride’s Gold is already proven here winning over 7 furlongs in June but the strength of that race has to be in doubt although she did win it very comfortably I would be surprised if there is not on in here to beat her. Simon Crisford has returned a level stakes profit with 5 winning fillies from the 22 he has sent here. Allante is probably the most exposed of the field but is at least proven over CD although her pedigree looks strong on paper the form of her win is again in question beating mainly much inferior rivals. Sir Michael Stoute has appeared to start concentrating his three-year old fillies here, in 2015 and 2016 he sent 8 fillies to the track without a winner but in 2017 he sent 4 here producing 2 winners and this year so far he has sent 9 here resulting in 3 winners returning a strike rate of 38.46% resulting in a level stakes profit of £33.50. Arabian Gift to me is the most interesting runner a 525,000 Guineas yearling by Dubawi whose three-year old fillies have a 55.56% (5 from 9) strike rate over CD but more interestingly are 4 from 7 when having their first run on Tapeta. 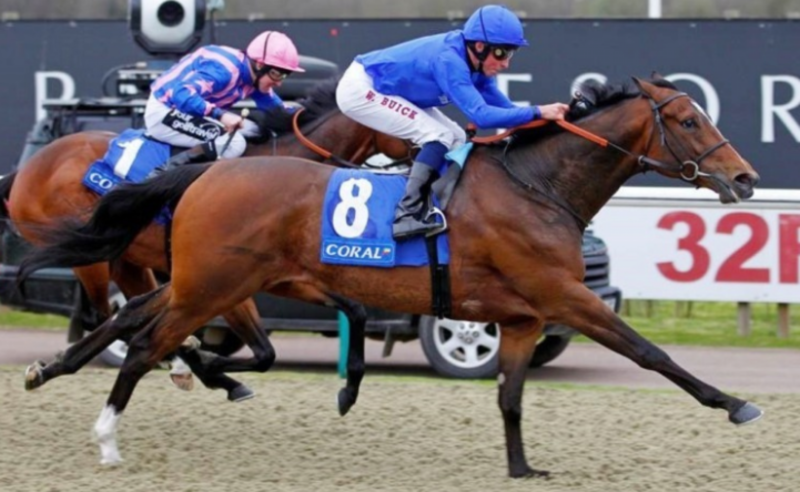 This is Charlie Appleby’s only runner at the meeting and since 2014 he has operated at a 35.94% (23 from 64) strike rate when only sending one to the track and although not profitable to follow blind if you narrow them down to handicaps the strike rate increases to 40.74 % (11 from 27) and we just break in to profit. If we further narrow this down to the trainers only runner combined with the jockey’s only ride we suddenly end up with a 54.55% (12 from 22) strike rate returning a level stakes profit of £9.34. Brett Doyle is 1 from 1 under the following criteria. Arabian Gift has been strongly fancied on her two starts as a three-year old going off at 13/8 and 4/6 fav, she did finish a long way behind Scottish Jig but that was over a straight 8 furlongs but I really think the switch to Tapeta and a left-handed track will be right up her street so at a generally available 7/1 looks well worth an interest to me. A very poor days racing on Wednesday but there are two runners I am quite interested in and both run at Kempton and both are ridden by jockey James Doyle. 6:40 Kempton: A speculative play here on Alshahhad, a three-year old gelding by Dubawi whose three-year old progeny have a decent 20.59% strike rate when making their racecourse debut on a polytrack surface and are 4 from 12 over 8 furlongs. In the last two years on the All Weather James Doyle has operated at an incredible 44.44% strike rate on three-year olds from the William Haggas stable that run in non handicap races. 8:10 Kempton: Magellan ticks a lot of boxes here and is 2 out of 2 on the All Weather so far including winning a competitive race here over 11 furlongs. On breeding the extra furlong should prove ideal being by Sea The Stars whose progeny have a 26.67% strike rate over 12 furlongs on a polytrack surface and are 10 from 33 over CD. James Doyle has generally operated at a 22.13% strike in All Weather Handicaps over the past two years and is 12 from 46 at Kempton during that same time period. He is 2 from 2 for Roger Charlton at Kempton, 3 from 3 on the All Weather and has generally being operating at a 42.86% strike rate for the stable over the last two years. With a lot depending on the ground and ever-changing conditions tomorrow is another day of limited investment. 1:50: With only one runner proven over CD and very little in the form of stats or trends to go on it is not a race I will be getting too involved in but the Richard Hughes runner Great Sound may be worth a small interest now 3lbs lower than his very cosy win over 13½ furlongs back in August 2017 when trained by J Gosden. He is having only his fourth run for the yard and only his second run after wind surgery, 33/1 looks a decent price. 2:25: Infrastructure should go well and could follow-up his latest win. He had earlier finished behind Corgi but that race was not run to suit and with Baileys Excelerate likely to take them forward he should get a better gallop to aim at here. Lynwood Gale is a lively outsider under Joe Fanning who has a 22.22% strike rate here in these type of races for M Johnston. 3:00: On My Ratings I have this very close between Street Parade and Soldier’s Call. It is difficult to know what to make of the form, the form of Soldier’s Call has a more solid look to it with the most recent win at Listed level and he has already beaten a few of today’s rivals. Street Parades form may not be as strong class wise but he has won his last two races by over 10 lengths and that form has since been boosted. Street Parade may be the one to go with at the odds but my play will be a reverse forecast. It generally pays to follow the younger generation in this race, with seven of the last ten winners being three-year olds, with four of those sired by Galileo including Frankel who won this race twice and he now sires the favourite Without Parole. Good recent form is a must with twenty of the last twenty-one winners either winning (13) or finishing second (7) on their latest start. The market is not always the best guide to finding the winner with last years winner returning at 20/1. We can discount several of the runners on the above trends, namely So Beloved (age/form), Lightning Spear (age/form), Lord Glitters (age) and begrudgingly Gustav Klimt (form). Without Parole finished ½ length in front of Gustav Klimt at Royal Ascot. Beat The Bank has yet to prove himself at this level with the same comment applying to Expert Eye although both are proven at the track only Beat The Bank has won over Course and Distance. The French raider, Orbaan is very unexposed, having only his fourth start. He won a Listed Event last time out and is now two from two for Silvestre De Sousa and may be over-priced at 33/1 with negatives about the majority of the field but it is a rather boring that I go with Without Parole who I have well clear on ratings and is proven at this level. I have played Gustav Klimt in the forecast and I will play Orbaan in the place market. 4:45: Four White Socks should appreciate the return to turf and Handicap Company after contesting a Group 3 on the AW most recently. I have a sneaky suspicion that Musical Art is better than she has shown and the sire’s three-year olds have a 21% strike rate at the track and are 3 from 8 over CD. 5:55: I will take a chance with last year’s comfortable winner Truth Or Dare who won off a 2lbs higher mark when looked campaigned for that race and the same applies here. 6:20 Sandown: I have Free Love penciled in here but I will wait until after Street Parade has run before committing fully.